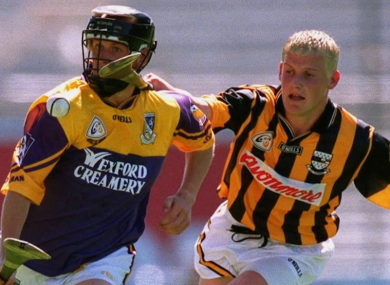 Jackie Tyrrell bleached his hair for a time during his Kilkenny career. KILKENNY GREAT JACKIE Tyrrell will kick-off the upcoming series of TG4′s Laochra Gael, with his episode set to hit screens next week. The towering defender picked up an incredible nine All-Ireland medals during his Kilkenny career as well as four All-Stars, and is widely regarded as one of the best hurlers in the modern era. His Laochra Gael episode chronicles those exceptional sporting achievements, but also features his memories of a time when he bleached his hair along with some of his Kilkenny teammates, including Tommy Walsh. “I can’t remember whose brainwave it was,” Tyrrell begins, “I think it was Tommy [who suggested] that we bleach our hair. We’d seen it done with the Bulgarians in the World Cup where they all bleached their hair. “We thought this would be a great idea. “The idea was we’d bleach our hair and take off our helmets when we were winning a game. It didn’t work out like that. It was really bad for me but Tommy hurled a world of ball and he was brilliant, I was brutal and I always remember being in Langtons that night with this big blonde head on me and I was thinking, ‘what am I doing here? Tyrrell suffered from confidence issues throughout his career with Kilkenny. He captained the side to Liam MacCarthy success in 2006, but questioned whether he was good enough to fulfill the role when the opportunity arose. The James Stephens went on to play an instrumental role when the Cats completed a three-in-a-row in 2008, but he was still struggling to feel satisfied with what they had achieved. “Small things were throwing me off,” the former defender says during his Laochra Gael episode. “I remember in the Citywest bar on the Monday and some journalist said something about me not being able for John Mullane and that he had taken me for three points. Why should I even cop that? And I remember reading it and reading it about seven times. It was more afterwards that it came back to me during the day and I was trying to push it out of my head. It’s just not right, that shouldn’t be sitting with you on what is such a special day. It was just drilled down into not accepting who I was. Episode one of Laochra Gael ‘Jackie Tyrrell — The Journey’ will air next Wednesday night on TG4 at 9.30pm. Email “'I had this big blonde head on me' - Tyrrell recalls bleaching his hair with Tommy Walsh ”. Feedback on “'I had this big blonde head on me' - Tyrrell recalls bleaching his hair with Tommy Walsh ”.